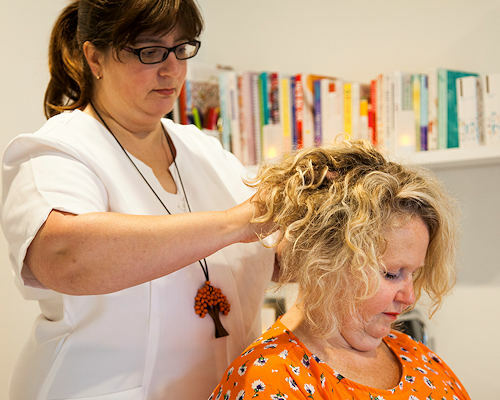 Indian Head Massage and Reiki to promote your wellbeing, both for your body and your mind. A private, professional studio in Christchurch. Off-street parking. Loyalty cards and gift vouchers available. Friendly service. Sue has special connections with people, particularly the elderly; supporting you with her therapeutic treatments. It is based on the ancient healing system called Ayurvedic. This therapeutic massage helps with stress relief, insomnia, eye strain, sinuses, stiff neck and shoulders, headaches and migraines. Indian Head Massage is a refreshing, relaxing treatment with healing properties. A hands-on massage on your shoulders, upper back, neck, arms, face and scalp. A full scalp massage is done with or without oils. The oils used by Sue have many good qualities to condition your hair and scalp. This will help with drandruff, hair loss, greying hair, hair growth and hair strength. Reiki, a Japanese technique which involves lightly placing my hands on the body or just above to allow the free flow of energy. Reiki supports the body’s wellbeing and self-healing ability. It goes to where it is needed most to assist healing within the body and mind. What makes my Reiki treatments special is insuring your personal comfort throughout the session. Reiki is a great stress reliever. You will benefit from regular and multiple Reiki treatments.